This project is based on the AEIOU heuristic framework of Design Engineering Approach. Design for Performance, Safety and Reliability is ensured in terms of segregation of the low voltage and the high voltage parts of the circuit. Design for Manufacturability and Assembly is ensured in terms of compact sensors that can be installed within the fields. Design for Aesthetics and Ergonomics is achieved in terms of remote access by farmers and seasonal and environmental based access to irrigation. Design for cost and Environment is addressed by correct usage of water, that has now become a prized Natural Resource. 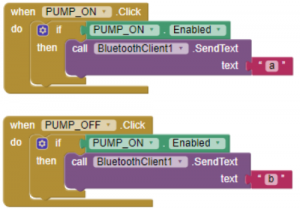 The system can be interfaced via Bluetooth Module using MIT App. The soil moisture sensor is used to measure the volumetric water content of soil. 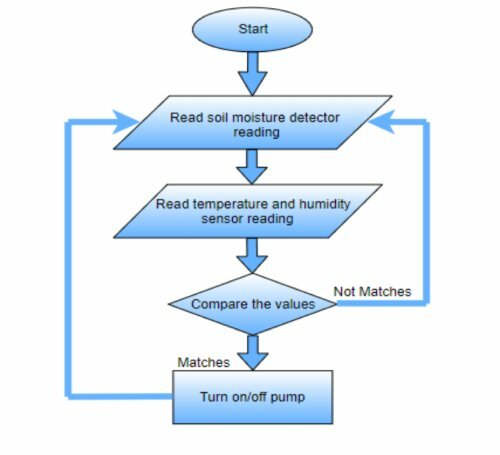 It is used to monitor soil moisture content to control irrigation in greenhouses. 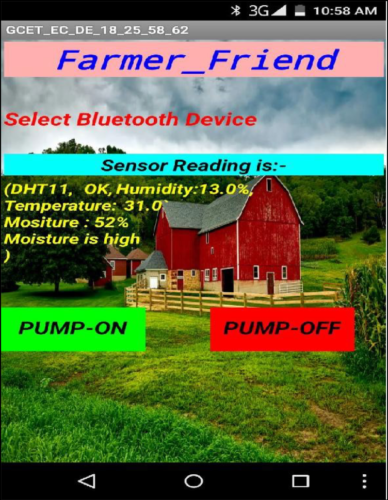 A moisture sensor is used to sense the level of moisture content present in irrigation field. It has a level detection module in which we can set a reference value. The temperature and humidity sensor is necessary to reduce the watering frequency. That is when the weather gets cooler, less water is needed whereas vice versa in the other case. The relay module is an electrically operated switch that allows you to turn ON or OFF a circuit using voltage and/or current much higher than a Microcontroller could handle. 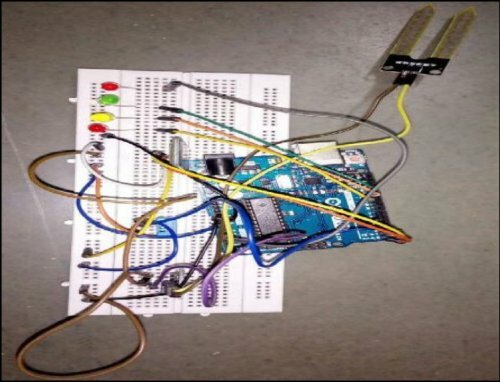 There is no connection between the low voltage circuit operated by the Microcontroller and the high power circuit. The relay protects each circuit from the other. Each channel in the module has three connections named NC, COM, and NO. Depending on the input signal trigger mode, the jumper cap can be placed at high level effective mode which ‘closes’ the normally open (NO) switch at high level input and at low level effective mode which operates the same but at low level input. A peristaltic pump is a type of positive displacement pump used for pumping a variety of fluids. The fluid is contained within a flexible tube fitted inside a circular pump casing. It is reputed to pump water from a depth of about 31 feet. The results of the moisture, temperature and threshold level can be calculated through the sensors used in the project. Analysis of soil parameters can be done and the needed nutrients can be calculated for the soil. The need of water supply of the soil can be calculated and hence appropriate irrigation is done through smart techniques. 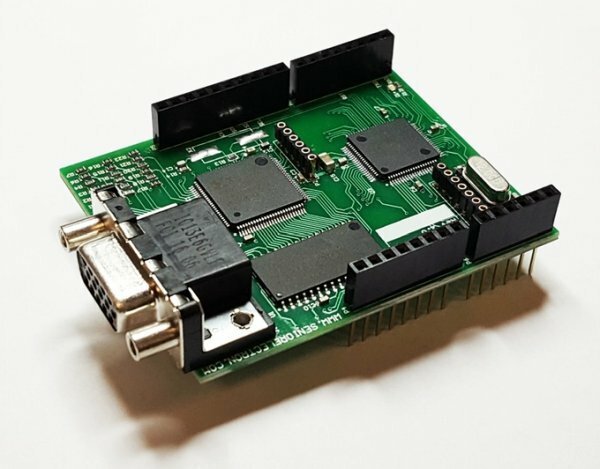 This module is used to configure all hardware devices. 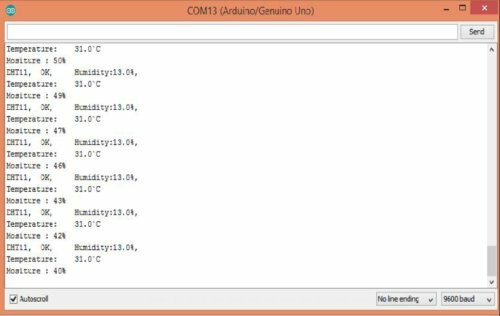 Soil moisture sensor, Temperature and Humidity sensor, Pump all are connected to major component arduino with Bluetooth connectivity. In this module we analyze the moisture content in the soil and it’s temperature. According to the sensor values further decision are taken. Once the values of temperature and moisture are generated on serial monitor. The threshold can also be notified on serial monitor itself. 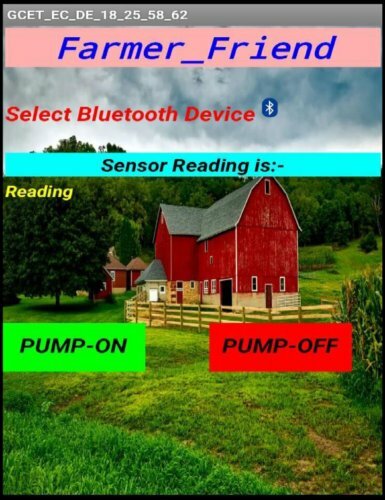 And if result of Moisture, Temperature and Humidity goes below the threshold value the pump will automatically turn ON and if the level of Moisture, Temperature and Humidity increase upto threshold level of field then pump will automatically turn OFF. In schematic, Red Wire- Vcc and Black Wire- Ground. 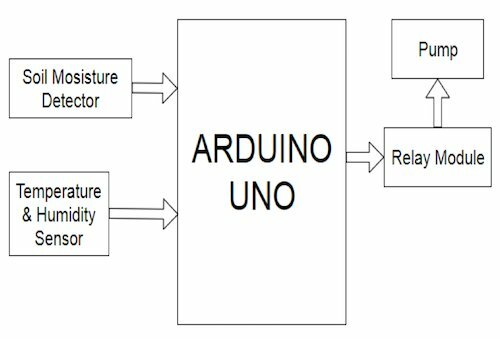 External supply is given to Arduino through 6V-1A Adaptor. In place of motor, connect 6V peristaltic pump. A theoretic study of the parameters considered in our project is summarized by study of different literature materials and papers published.